yep, always open for onroad practice before race days. we're setting the track up friday so itll be ready early saturday. 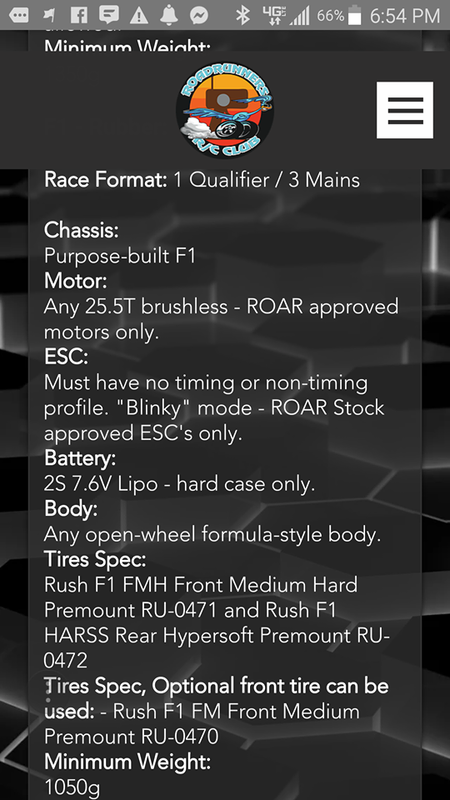 M-Chassis rules and guidelines for the upcoming On-Road Race Series in March! lightfoot and Maxxican like this. So far Saturday practice after 10am is looking really good. Sunday is kind of up to the forecaster.. I dunno.. I'm going to be there both days with the track open. We just cleaned the entire track and pulled up all of the tiny rocks and put down some sauce. I will have the track open by 10 tomorrow with the best traction possible. I'm running the Rush 36x btw, it's not cold enough with our friction to justify 32 or lower. The weather looks good! We're going to prep the onroad track Friday and be open early Saturday for practice all day and club racing on Sunday. From what I can see so far, we should be able to be on the track by 8am Sunday and have racing started by 9:30 and get 3 rounds in. Tell the kids to bring their mod cars out! Damn son! feels like a call out, I'll hit up a few of the guys and make sure we have a class if you're going to be in town. Whatever needs to be done to avoid running 17.5! See you in the AM tomorrow. Round 1/6 of our spring series is starting this weekend. Pardon the slightly late announcement, I have been watching the weather fairly closely. Look to be racing by 9am. F1 rules and guidelines for the upcoming On-Road Race Series! Let's bring out those F1's! Last edited by JS; 03-09-2019 at 08:54 AM. The 0471 is a medium hard tire...the updates list it as something different. Thanks to everyone that made it out for our first go at running both tracks. The offroad series has been concluded and awards given out. I'll update the FB page when I get the pictures from ActivRC since I happened to leave the sheet at the track. We had a bit of trouble with dust from the offroad but I'll be addressing that on the offroad side so 1st/3rd weekends will have the same grip as 2nd/4th to make testing accurate. All times are GMT -7. It is currently 07:31 PM.